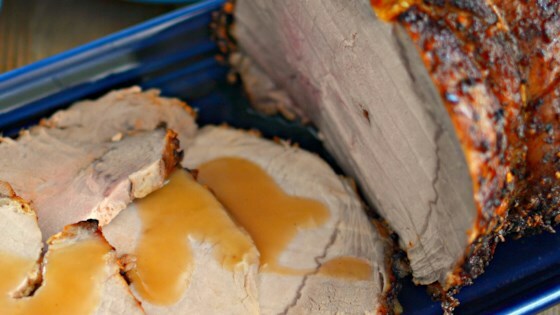 "Super moist and flavorful pork tenderloin prepared in an Instant Pot®." Turn on a multi-functional pressure cooker (such as Instant Pot(R)) and select Saute function. Heat olive oil until shimmering, 3 to 5 minutes. Season pork tenderloin with Greek seasoning, salt, and pepper. Add to the preheated pot and cook until browned, about 3 minutes per side. Transfer to a plate. Pour apple juice into the pot; scrape up any pork bits left on the bottom. Set rack inside the pot and place tenderloin on the rack. Close and lock the lid. Select high pressure according to manufacturer's instructions; set timer for 10 minutes. Allow 10 to 15 minutes for pressure to build. Release pressure using the natural-release method for 10 minutes according to manufacturer's instructions. Quick-release any remaining pressure. Unlock and remove the lid. Lift out tenderloin and set aside to rest for 5 minutes. Meanwhile, remove 1/4 cup of the liquid from the pot and mix with cornstarch to make a slurry. Pour slurry back into the pot. Select Saute function and simmer sauce until thickened, about 5 minutes. Slice pork and drizzle sauce on top. Watch how to prepare a succulent herb-crusted pork tenderloin. Substitute chicken stock or root beer for the apple juice if preferred. I was lucky and it cooked to 140 degrees and came up to 145 after resting. As suggested I used chicken stock which made for a great gravy. A good sear is important for flavor.